HOME BREWING PUMP - The CHUGGER PUMP can be used to ease transfers between kettles, cool wort via a counterflow chiller, or recirculate ice water for quicker chilling! 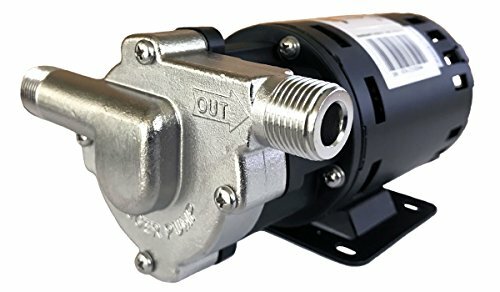 HIGH QUALITY MATERIALS - Stainless steel pump head, Magnetic Drive w/ base, Teflon thrust washer, Clear Silicone O-ring, Ryton/Teflon Impeller, 55" cord with plug. PREMIUM PERFORMANCE - Featuring a max flow rate of 7 GPM and 18 Feet of head to handle back-pressure. Capable of handling liquids up to 250 degrees F.
FOURTH BULLET - The CHUGGER PUMP is the only home brew pump with ETL certification and USFDA food compliant materials tested for safety and performance standards. 1/2" MPT inlet and outlet, allowing easy configuration for any application! If you have any questions about this product by CHUGGER PUMP, contact us by completing and submitting the form below. If you are looking for a specif part number, please include it with your message.